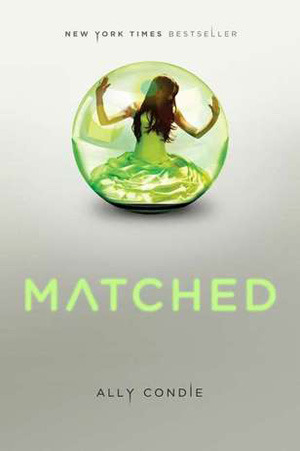 Matched is yet another book I have always wanted to read, and left me quite detached. This will probably be a short review because that’s how unconnected this book has made me feel. In their Society, people are told what to do with ther lives: what to eat, how long to run, what work to do, and one of the most important ones, who to settle down with. They could even predict which among a list of choices one would make through their overall make up. They try to match people with their build up and personality with people who they would produce optimal progenies. Their world is a world where living is made simpler for humans, created to give the best human experiences to everyone by giving them the choices that are optimum for them, to avoid unfortunate events, to keep them happy. But then how do one get to be happy when they aren’t allowed to make these choices by themselves? That is the question that Matched raised. It sure will make living a lot easier. But to follow society, its dictates and rules without questioning why, is it truly living a life? The book starts with Cassia’s highly anticipated Matching Banquet, where she gets to see who she’s going to marry once she turns twenty-one. When it was her turn to be matched, her screen hangs into a blank screen, which is actually a dreadful thing for it means she is not matched with anyone. The screen, after a few more moments, turned up with her childhood friend’s face and name, Xander. She was immensely glad to see Xander’s face, familiarity with someone she’s matched with is a very advantage anyone in their time could have had. Unusual, but not an impossibility. The feeling of security shatters after a short-lived happiness as the following day, she decides to explore Xander’s information on the given microcard containing his info. It was not Xander’s face she sees. Rather, in another eerie event, she sees another person she’s familiar with: Ky Markham. The book is actually good. Every aspect of the world they’re in is well explained. What I don’t like about this book though is the slow build up, that never really ascended, for me. For a long time, the events were rather dragging and almost repetitive. If you’re into something slow creeping until it catches you off guard (slightly), then maybe you will love this book. But it just doesn’t work for me. A very fascinating point though is the experiment done in this book. (I’m not going to drop spoilers here, so you better read the book!) It raised a question of morality and truly, do we only fall in love with people we thought deeply inside of us we’re going to be together with? Like, if we were told our soul mate is Brad Pitt, we’re going to fall in love with him because somehow we knew were programmed or destined to do so?